But, back to the café… I don’t remember their name, but I do recall this sandwich. It was originally made using a toasted bagel, which was smeared with gallops of cream cheese and then topped with whatever scrambled egg combo you could come up with, covered with the other bagel half, again heavenly smeared with cream cheese, wrap and delivered. 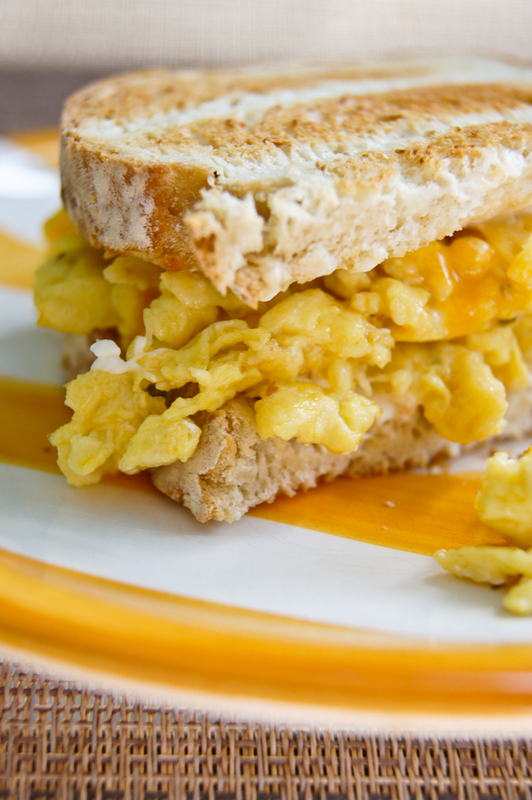 By the time you would unwrap it, the warmth from the toasted bagel melted the cream cheese, which would bleed through the scrambled eggs, making this the creamiest egg sandwich you would ever eat. I’m not kidding you guys – it is the BEST THING EVER! Don’t believe me? I suggest you hop to it and open that refrigerator and take that carton of eggs and whip this bad boy up! All of the ingredients are really up to your taste, but if you need to omit anything do so except the cream cheese, that is the secret to this sandwich. When it comes to eggs, I’m lame. I like simple, I may go for broke and add cheese and maybe crumble bacon or ham. If I’m fully awake I go the creative route and add tomatoes and spinach. But, for the most part – simple eggs for me. In a small mixing bowl, combine eggs and milk with a fork, I usually add my cheese here too. In a non-stick skillet, melt the butter over medium-low heat until it bubbles. Stir a pinch of salt into egg mixture then pour into pan, stirring slowly with a heat resistant rubber spatula. As soon as curds begin to form, increase heat to high and instead of stirring, use the spatula to fold the eggs over themselves while gently shaking the pan with your other hand. As soon as no more liquid is running around the bottom of the pan, remove from the heat, season with fresh black pepper and put aside. Remember: if they look done in the pan, they’ll be over-done on the plate. Now time to assemble your sandwich. Take your toasted bagel (or bread) and cover with cream cheese, I would go with 1 to 2 tablespoons of the stuff – make sure your whole bread is covered. Lay your bacon and then add your scrambled eggs on top. Top with the other half of the bread/bagel and voila! I usually let it sit for a bit (approx. 2-3 minutes), to get that cream cheese all nice and melted. This is also good for a quick dinner, especially when you are too tired to even care. After you make it, come back here and let me know what you think.